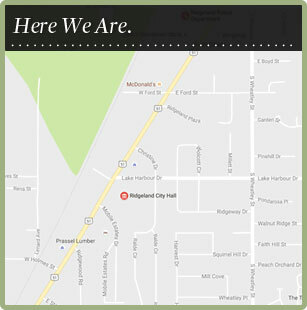 The City’s Utility Billing Department is located at Ridgeland City Hall, 304 Highway 51. Water, sewer, solid waste collection, and recycling collection fees may be paid from 8 a.m. to 5 p.m., Monday through Friday. A drive-up window is available for your convenience from 7 a.m. to 5 p.m.
Q. How do I arrange for water service? A. Apply in person at City Hall located at 304 Highway 51. You will need to bring in a photo ID, a copy of your lease or deed, a water meter deposit and sign a water user agreement form. Water meter deposits for residential and commercial customers vary, depending on the size of the meter. Q. When will I receive my bill and when is it due? A. You may receive your bill by mail or by e-mail, during the first week of the month. Sign up for e-billing through our online account system. Bills are due on the 16th of the month. The due date of the bill is printed on the upper right hand corner of your bill. Your water bill has two amounts due, net and gross. The net amount is to be paid before or on the due date. The gross amount is to be paid if you pay the bill after the due date. Q. What if my payment is late? A. The late charge is calculated as 10% of the current month’s bill. If your account becomes two months past due, it will be subject to disconnect. A disconnect notice will be sent via phone call or text. Please make sure your phone number and/or cell number are up to date with the utility billing department. A fee of $25 will be charged if your bill is not paid by 5 p.m. on the late notice due date. There is also a fee of $30 charged for a Non-Sufficient Funds check. In order to save late charges, please try to pay your bill as soon as possible after it is received. To avoid late charges completely, sign up for our bank draft system. A. We encourage all of our new residents to utilize our bank draft system. Complete a Bank Draft Authorization Form and return to the Utility Billing office or pick a form up at the office. Bank drafting your water bill will help you maintain a current standing on your bill each month and avoid paying a late charge. There is no extra fee for this service. Please verify that your bill is correct, and if not, call our office to avoid drafting that payment. The bank draft is drafted from your checking account on the due date printed on the water bill. We hope you consider using this service. In person at Ridgeland City Hall located at 304 Highway 51, Ridgeland. Office hours are 8 a.m. to 5 p.m. Monday thru Friday, except for legal holidays. We accept cash, check, money order, Visa and Mastercard for payment. Debit cards are not accepted. There is a 3% surcharge on credit card payments. Drive-Thru Window is open 7 a.m.-5 p.m. It is located at Ridgeland City Hall. Q. What do I do if I get a Leak Letter? A. All water meters are read electronically each month. The computer system will generate a list of meters that show consumption for a 24-hour period. If you receive a letter, please consider a couple of questions first: 1) Do I have a malfunctioning toilet? They can consume a remarkable amount of water during a short period of time. Check and repair quickly. 2) Is there a leaky faucet? Please feel free to contact our office to better assist you. Q. Why do I have to pay for Jackson sewer when I don’t live in Jackson? A. In order for wastewater treatment to be more cost effective, many cities located near Jackson have an inter-local agreement with Jackson to use their sewer treatment plant. Q. Why do I pay for Ridgeland sewer too? A. The City of Ridgeland has to finance the placement of sewer lines and sewer pumping stations in order to get the sewer to the treatment plant. Providing for safe disposal of sewer is a very costly service. We strive to provide high quality water and sewer services to our residents in the most economical way possible. Q. How is my bill calculated? A. Water and sewer charges are based on your water consumption, so if you use more water, your sewer charges will increase as your water charges increase. Remember, if you are watering your lawn, you are also paying sewer on that water, unless you have a separate meter for your sprinkler system. Base flat fees are charged for water and sewer usage. Fees are charged for every thousand gallons of water used. Rates change every February 1. Contact the Utility Billing office for the most up-to-date rates. The City of Ridgeland contracts with Waste Management, Inc. for city garbage removal and recycling collection. There is a mandatory fee for both services in the City of Ridgeland. If you do not have a recycling cart provided by the City of Ridgeland, please call Public Works at 601.853.2027 and arrange for pick-up or delivery. Register with Recyclebank at www.Recyclebank.com to earn rewards for recycling such as discounts at local and national retailers. Q: What steps do I take when I move? Complete and submit a Request to Disconnect Service form. Leave the recycling cart with the service address. We hope we have explained most of your questions concerning water, sewer, garbage and recycling billing. If you have further questions, contact our office at 601.856.3938 or email UtilityBilling@RidgelandMS.org. We will be glad to discuss any questions or concerns you may have. To receive timely notifications by phone, email or text messages including any water outages, sign up for Ridgeland Alerts.